Training employees is a key area in which any company should always take serious time and consideration to do properly. Training is something that sets the tone for customer experience and is a terrific investment into any business in general. At Peach State Roofing, the notion of continual field and classroom training has become a main staple for all nationally located offices around the country. Each year, management has been working to implement new and better practices for teaching PSR employees on all levels better roofing practices that will in the end deliver better roofing projects. As part of the continual education and investment into Peach State Roofing employees, a large team of management representatives were recently sent to the Carlisle Construction Materials campus in Carlisle, PA for a first-class training experience. CCM has made major investments into its facilities including a new world-class training center equipped with classrooms, auditoriums, hands on roofing/training simulation rooms and more. The training event for Peach State employees was a two day duration. PSR team members were taught by Carlisle representatives on the history of work between PSR and Carlisle, an overview of Carlisle as a company and then went into specific product education. The focus of the education time was built around productivity boosters and innovations with primary details revolving around re-roofing practices on existing buildings. The key product lines taught were on EPDM, TPO, PVC, Polyiso and then later the specific technology of Fleeceback materials. Carlisle was well represented by very knowledgeable product experts who answered a lot of specific questions and explained in great detail advantages of the Carlisle product line. On day two of the training, Peach State Roofing employees were given a more thorough tour of the training center as a whole. Some key areas pointed out were the interactive screen training walls, the hands on ‘FSR’ installation rooms and an open field roof installation area for product demonstrations. The interactive screen training wall area was one neat feature that caught the eye of many of the PSR representatives there. This wall was a touch screen detail where people could learn of the history of Carlisle, product details and so much more. The main hands on time for PSR employees was done in the product demonstration area/mock-up room. Key products on display to Peach State were Hydrobond adhesive to PVC membrane, TPO with APEEL technology, SAT TPO and EPDM, CAV GRIP III adhesive and the all new Rapid Lock technology membrane system by Carlisle. All of the product lines were great innovations in the roofing industry and the education done by Carlisle was done with extreme quality. Overall, the two main products that seemed to impact Peach State Roofing representatives the most were the CAV GRIP III demonstration and the Rapid Lock demonstration. After the product demos were complete, PSR sat down with Carlisle representatives on the topics of Job Close Outs and Inspections. Key points of interest were discussed in what Carlisle inspectors were looking for and how PSR and Carlisle could ensure a successful roofing project close out experience. Lastly, PSR representatives were taken on a plant tour of both the EPDM and TPO lines on the Carlisle Construction Material campus. The entire experience as a whole was a first-class experience. It was noted by many PSR employees who attended that it was great to see the investment Carlisle is making into training roofing professionals around the country as a whole to make the industry in general better. PSR plans to send a second large team of individuals up to the Carlisle training experience soon as continual investment into its own employees. 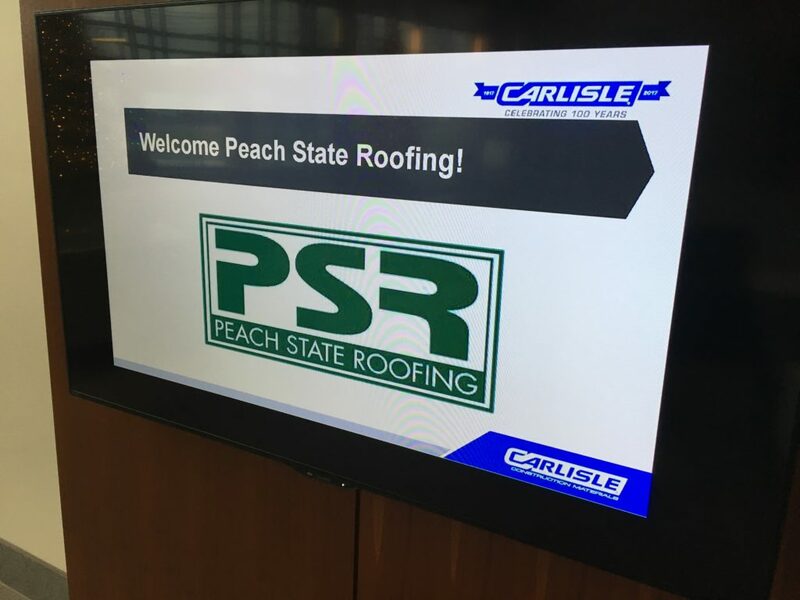 Peach State Roofing as a whole would like to thank Carlisle and all of its professional team members for hosting this terrific event.